read interviews with, or biographies of, riders from yesteryear and at some point in the conversation, mention will be made that the racing today is a tad different from what it was in their time. though some of those comments may be tinged wth nostalgia, it is a contention with which it's hard to argue. the velominati amongst others have been keen to point out that not only did eddy merckx race from the spring classics all the way through to lombardy, but managed to win more than a select few in the process. and merckx was hardly alone in such efforts. whereas the majority of contemporary riders, particularly those designated as team leaders, are more likely to target specific races or parts of the season, not so very long ago (let's call it the pre-lemond era for convenience' sake) it was expected that every man would do his duty, no matter that they were rarely fighting for other than second place. of course, this season-long situation began long before merckx pulled on a peugeot or molteni jersey. in the recently reviewed book bird on the wire, tom simpson and his peers frequently needed to show well in the tour de france in order to guarantee their earnings by way of post tour criteriums. nowadays, the millions of pounds oft quoted when sponsorship is discussed, have eased the pain of the need for perpetual victory in order to guarantee a comfortable stipend. sponsorship, other than that of specific events, was all but unheard of at the turn of last century. the inaugural tour de france, as we all well know, was the brainchild of henri desgrange, born of a need to increase the circulation of his newspaper at the expense of those of his competitors. 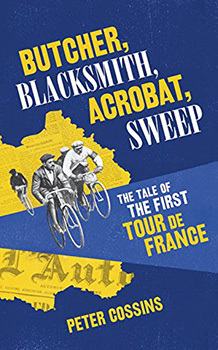 we have been recently reminded of this with the publication of butcher, blacksmith, acrobat, sweep - the tale of the first tour de france, a superbly forensic recounting by renowned author peter cossins, of the first, six stage event that took place in 1903. that the book illustrates its subject so well and in such an eminently readable manner is of great credit to its author, but the undertaking to write about a race that took place 114 years ago, seems almost rash. was this cossins' idea or the result of an unfortunate bet? "It was my idea and stemmed largely from reading conflicting and sometimes very inaccurate accounts of that first race. One thing that struck me quite quickly and led to me putting together a book proposal, was the fact that very little was said about the political, cultural and sporting situation in France at that time. As someone who has spent a lot of time in France and now lives in the country, that really interested me." peter makes a highly relevant point, for even today, any recounting of this year's tour de france is highly unlikely to make mention of the current french president emmanuel macron and the salient knowledge that his en marche! party is a remarkably recent addition to the country's political scene. whether any dyed-in-the-wool cycling fan is particularly interested is something of a moot point. but in laying bare the machinations of that first ride across france, it would be a less than responsible dissertation that ignored the national and european circumstances under which the race came to fruition. but allowing for the fact that cossins felt compelled to bring us not only the twists and turns of the competition, but also the context in which they thrived, it remains that all this took place over a century ago. how does a writer go about researching an historical subject such as this? "By spending a lot of time digging through the newspaper archives in the Bibliothèque Nationale de France in Paris. Thankfully, a lot of its archive is available online, which helped get me started. There are also plenty of books in French about that race and period, although, surprisingly, not a single one about Maurice Garin." that in itself must be regarded as somethng of an oddity. with prince bradley having provided us with at least two published insights into his competitive career and alisdair fotheringham having recently regaled us with a well-curated insight into that of miguel indurain, you would have thought it likely that the winner of the very first grand boucle would have merited at least one or two compendia over the last hundred years or so. for those of you who have read butcher, blacksmith, acrobat, sweep, you will be aware that the gent engendered more than one or two anecdotes in 1903 alone. however, there still remains the inescapable fact that both wiggins and indurain are still in the land of the living and possibly available for interview. it surely must be a potential stumbling block that none of those participating in the 1903 tour are still with us. nor, indeed, are those who witnessed the event at first hand. didn't this complicate matters somewhat? "To a degree, although the race was very extensively covered in contemporary newspapers. One of the oddities, though, of reporting then is that journalists didn't tend to give too much space to the views of the riders, so there are very few direct quotes from any of the participants apart from Garin, Hippolyte Aucouturier and Rodolfo Muller. "It's clear that most of the journalists knew the riders well and spent a lot of time talking to them, but they tended to use the riders' words to support their own analysis of the racing, rather than present them directly. Reading reports from other sports, this style of reporting wasn't exclusive to cycling." on the basis that i sit down each evening and scribble a few hundred yellow backed, black pixelled words, it has been suggested that i should probably write a book. however, with no disrespect intended, those people are wrong. it's all very well for me to undertake a modest level of background research when necessary, before committing fingers to keys, but the word systematic is not one to which i readily answer. and then there's the matter of time. how long did butcher, blacksmith, acrobat, sweep take from conception to handing over the final draft? "It probably took the best part of a year, although I only worked flat out on it during the final four months." for readers of butcher, blacksmith, acrobat, sweep, not only was there the thrill of the chase, but the opportunity to learn more about an event that has effectively fostered the sport as we know it today. it's possibly every bit as important as watching footage of this year's event. yet despite as i believe i mentioned to peter cossins in an e-mail, we already knew that the butler did it and even the name of that butler, there was the sensation of being on a voyage of discovery, to learn not only of the race and its competitors, but the scenery in which it was played out. but what of the author? is it important to be previously aware of the facts prior to the commencement of writing? was this also a voyage of discovery, or was he already familar with many of the race specifics? "I knew all of the basic details - who won where and the final placings - but I didn't know much at all about the riders, and very little at all about the political and cultural influences that also played a significant role in the race's foundation. I was really interested to discover a lot more about the language used to describe the race and the riders, and how, for instance, fears of another German invasion coloured this language so much. Even then the Tour was marketing France and any number of brands, but it was also marketing French manhood and strength, presenting the riders as examples of vitality, virility and determination." thewashingmachinepost began almost as an exercise independent of the subject matter with which it deals. i have long been a great admirer of charles m schultz, writer and illustrator of the peanuts cartoons, particularly for his tenacity in successfully offering humorous, poignant and relevant cartoons for almost fifty years. i was fairly sure that, in the mid-nineties, i could scarcely hold a candle to such awareness and intelligence, and so conducted what began as an experiment to see how long it would last. thankfully, things have gone far better than i could have hoped, but there was always (and still is, to be honest), the strong possibility that i'd bitten off more than i could chew. that, i tend to think, must surely remain at the back of every prospective author's mind. to have conducted negotiations with a publishing house and agreed a timescale for delivery of the final draft, personally i would always be concerned that tomorrow might never come. or perhaps, the next chapter. were there any points during the writing when peter thought he too had bitten off more than he could swallow? "Not at all. I enjoyed writing this book more than any other I've done before. I got swept up with the race, with the personalities, with every aspect of it. By the end, I was completely convinced that the significance of the first Tour is all too often overlooked. It was, after all, cycling's first stage race and the race that led the sport away from the use of pace-makers. Finding out more about it revealed an awful lot about how the Tour became the race it is now." when investigating the whys and wherefores of the ideal training regime, that we might improve upon the meagre fitness and speed that is currently ours, the modern idiom continually emphasises the need for rest and rest of a quality upon which we have scarcely crept before. it would be naive to suppose that this formula is one that applies solely to the quest for velocity and a honed physique. after the trials and tribulations of exploring a century old cycle race, will peter's next book be about something simpler to research? "I can't say what it's about, but I already suspect it's going to be harder to research, or perhaps harder to structure and write." i fear mr cossins needs to revise his training schedule, should such a concept exist for hard-working authors. 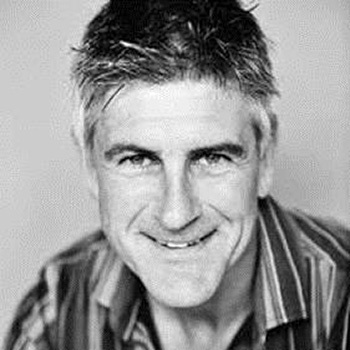 but finally, after the publication of such an essential volume for the cycling bookshelf, it seems only fair to ask who will play the part of peter cossins when steven spielberg makes the film version of butcher, blacksmith, acrobat, sweep? "George Clooney, almost certainly. On a serious note, I think the story of the first Tour would make for a fantastic film. Sporting heroics, cheating, murder and bouillabaisse - it's got it all! butcher, blacksmith, acrobat, sweep - the story of the first tour de france, is published in hardback by yellow jersey press.